On Sunday I ran my first half-marthon. I never thought I’d be writing this post to you. Why? Because I’ve never had any interest in marathons. I have never liked pressure/physical-competition (sports). To me, the idea of pushing myself to run a marathon felt like pressure/competition/measuring success. And so I have never had it on my radar. Why would I volunteer myself for a pressure that I don’t even care about? Until this weekend… I realized that for me, running a race is not about pressure (I know for many it may be, but for me it was NOT). Saturday was the MOST physically empowered I have ever felt. This shock ran through my veins through the entire race and overwhelmed me when I crossed that finish line. I became emotional and couldn’t help but cry from feeling proud. As Haley (my cousin) and I ran through the finish line the woman on the loud speaker said “Let out all of your joy! Joy kept inside won’t do anyone any good! Let it out!” I get emotional again as I write and remember this moment… How true is this encouragement? I couldn’t believe it. We had just ran 13.1 miles. I’ve never run more than 6 miles in my life. I didn’t train for this. We were supposed to be walking and, before Sunday, I didn’t think I even cared to finish. Here’s why this meant so much to me. I’ve always wanted to like running (it has always sounded like a nice idea) but up until this weekend I never felt that I really loved it. Saturday showed me the kind of running that I want to be apart of. The kind where there is partnership, community, challenge and encouragement. As I write this to you another thought comes to mind: I have never been a sports person because I have never liked competition under pressure, where others are watching. However, competing with myself for fun and because I believe in myself? That’s different. With God, I can do anything. We are much more capable than we realize. We woke up Sunday morning thinking “How in the heck are we going to finish walking this in less than 4 hours?” In my mind I was anticipating pain and wanting to quit, but pushing myself to finish. Haley and I took off running at that start line. We took it nice and easy — a great, comfortable pace where neither of us were ever out of breathe the entire race. After we got to mile one, we knew we could get to mile two. Then three, four, five, six, and so on… when we got to mile nine we were amazed. The entire time we cheered each other on. We celebrated every stinking mile. We were so proud of each other. We appreciated the fact that we, cousins, were doing this together. We recognized that we’d never done anything like this together before and we felt happy. We never once told ourselves we had to run the whole thing. We had 100% permission to walk, anytime we wanted. The only thing we decided was that we would finish. If we did that, we succeeded. This mindset freed us up to push ourselves from a place of possibility, not punishment. At one point, likely after mile nine, it felt better to jog than to walk. Our lungs and cardio were primo. Our joints (my hip and Haley’s knee) were pushing it! But we did it. I am in awe of our bodies and my faith in and love for people is refreshed and rejuvenated. Never before have I had so many strangers cheer me on, high five me, and shout empowering things to me as I did something physical. Again, never did sports. What an incredible feeling and experience. I’m already looking forward to my next half marathon. This is such an example to me that exercise is NOT about weight-loss. Lord, it is about so much more. Let’s not reduce it to a focus on numbers/calories. Rather, let’s see exercise/movement for what it can really be about: achievement, accomplishment and increasing how much you believe in yourself. It’s about appreciating your body and all that it can do (no matter how much it can or can’t, always showing up for the things you CAN do). As we ran that marathon I saw a woman being pushed in a stroller, I saw a blind man jogging with his guide-dog and a leader, and I saw a person who struggled to even walk out there doing his thing, as best he could. People are so capable. Use everything you have, no matter what it is. 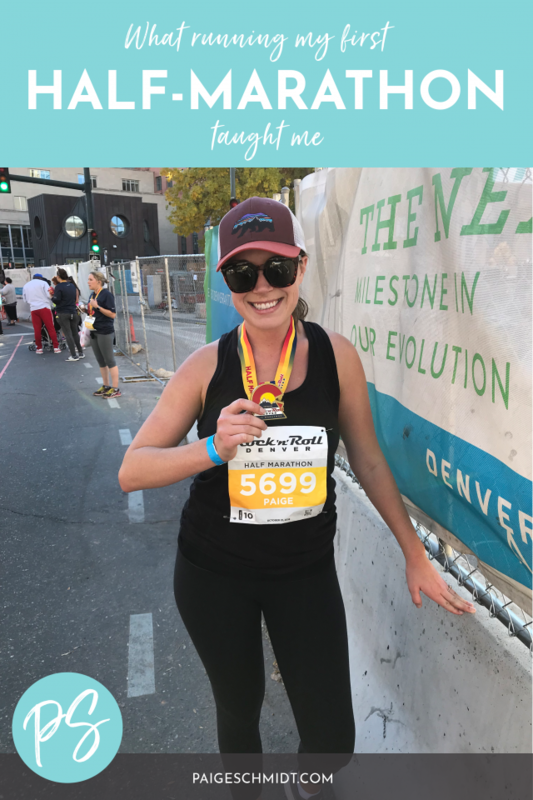 I don’t know where I’ll go from here — whether I’ll start running regularly or if I’ll plan to do a full marathon one day and none of that really matters to me. What I’m riding on from here on out is the empowerment I felt this Sunday and how proud of myself I am. I’m celebrating the fact that when we’re in the moment, the drive we have for something is outrageous (it’s not something we can plan for). We can do things we would never think possible. We are capable of so much… we can do hard things! I share this experience with you today to share a different perspective on pushing yourself — to share how rewarding it can be to challenge yourself, believe in yourself and encourage yourself the whole way through. And to remind you to celebrate yourself. Cheers to you! Cheers to our unbelievable bodies. I would love to hear your takeaways and I hope this post encourages YOU that you are possible of far more than you know in this moment — you ARE.